Sorry I haven't had much to say on poetry lately. I'm writing another novel, so don't be surprised if the lull lasts for the three-four months it'll take me to put together a draft. 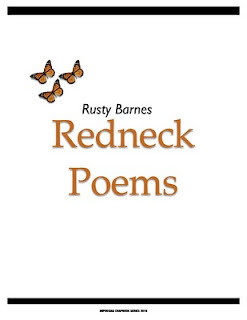 In the meantime, Sheldon Compton reviewed Redneck Poems and has some smart things to say about it, for a guy who says he doesn't talk about poetry much. I'm not a poet. Wouldn't know a couplet from a coupling. It's why I rarely talk about books of poetry and even more rarely write poetry, but I felt a stout and strong urge to talk a bit about Rusty Barnes' REDNECK POEMS. In this collection of fourteen poems, there is much to appreciated in as far as poetic device is concerned. I can recognize that much, but I'll go no further on that topic. Rusty moves as easily from poetry to short short fiction to longer works to editing the writing of others with equal ease and skill. MORE. If you're still missing this tiny book of mine, why? It's free.